The reflectances of a number of different barium sulfate substances were measured. The measurements show a correlation between the reflectance and chemical impurities as well as their grain sizes. In view of the problem of developing better working white standards, the importance of these results is discussed with respect to the magnesium oxide white standard, as well as the perfect diffuser which the CIE recently recommended for ultimate adoption as the reference standard. Absolute luminous reflectance of barium sulfate. e Measurements made by the author at the Color Research Laboratory of the Bundesanstalt für Materialprüfung, Berlin. f O. E. Miller and A. J. Sant, J. Opt. Soc. Am. 48, 828 (1958). Particle size, reflectance, and chromaticity coordinates of BaSO4. Absolute luminous reflectance of magnesium oxide. a A. K. Taylor, Proc. Phys. Soc. 49, 105 (1937). b G. W. Gordon-Smith, Proc. Phys. Soc. (London) B65, 275 (1952). c J. S. Preston, Trans. Opt. Soc. 31, 15 (1929). d W. E. K. Middleton and C. L. Sanders, J. Opt. Soc. Am. 41, 419 (1951). f J. G. Priest and J. O. Riley, J. Opt. Soc. Am. 20, 156 (1930). 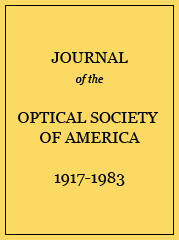 g P. A. Tellex and J. R. Waldron, J. Opt. Soc. Am. 45, 19 (1955). h Benford, Lloyd, and Schwarz, J. Opt. Soc. Am. 38, 445 (1948).